Experienced joiners from Edinburgh, B&M Joiners & Building Services stepped in to offer cash and craftsmanship support for a recently burgled youth centre in Edinburgh. The Fetlor Youth Club, founded in 1924, helps disadvantaged youth across the North of Edinburgh. It was broken into and over £2,000 plus important club equipment was taken from the premises. Danny McGuinness, ex Fetlor member and now owner of B&M Joiners & Building Services and its sister company Sash & Case Windows Direct saw a Facebook post which announced the sad news that the club had been broken into. Seeing this, he and his joinery team wanted to reach out and help. They contacted the management at Fetlor to see if there was anything they could do. Once the news had been posted on social media, Danny rounded up the Edinburgh team and they approached the club to offer help with repairs and restoration of the damaged centre. A cash gift of £500 was also donated to the club. The team in Edinburgh hope this support will help the Fetlor Youth Club get back on their feet and continue to deliver the vital support services for their youth membership. Founded in 1924, Fetlor is a youth club based in North Edinburgh. Ten years ago, the Board of Fetlor and the Schools who help found the club, Fettes and Loretto, decided to further raise the ambition of the Charity and the social impact it could make. The club now have a new £2.5m dedicated youthwork hub completed at the end of 2016. Funding for this came from former pupils and national charitable trusts – as well as the efforts of pupils themselves. The Board is now in the process of building an expanded team and youthwork program. Their ambition is to work with over 1,000 young people in North of Edinburgh each year. 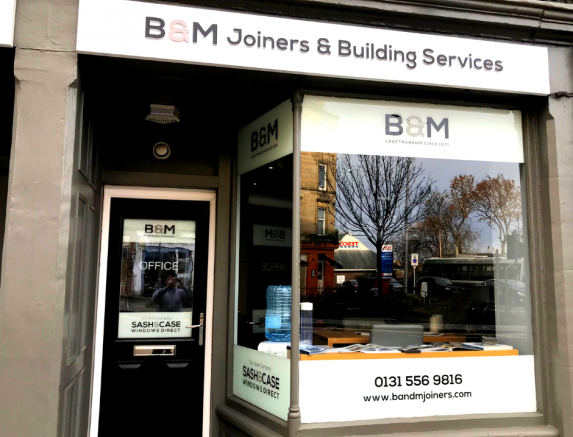 Established in 1970 and now owned and run by Danny McGuinness, B&M Joiners & Building Services and their sister company Sash & Case Windows Direct are based in Edinburgh but also cover the whole of Scotland. The business undertakes all trades including residential and commercial joinery and building projects from day-to-day repairs up to long term contract work. Specialists in all aspects of domestic and commercial sash and case window repair, restoration and replacement. Beautifully manufactured windows are bespoke fitted for all period properties. The team provides attention to detail in key conservation areas around Edinburgh and Scotland. Be the first to comment on "Big Hearted B&M Joiners & Building Services Donate Funds to Crime Hit Youth Centre in Edinburgh, Scotland"